Since United had its bond issue in early 2010, the club has reported increased year-on-year revenues every single quarter. This revenue growth has more than offset rampant wage inflation. Meanwhile of course the club has clocked up Champions League finals and Championships. This season the performance on and off the pitch has stalled somewhat. The numbers for the next quarter (which runs from April to June) will be worse again. For the Glazers, the clever trick of football success on a limited budget with high and seemingly ever increasing profits may well coming to an end. Will they spend at the expense of those profits? If they don't, will the success and hence the profits still be achievable? It's getting harder to square the circle. 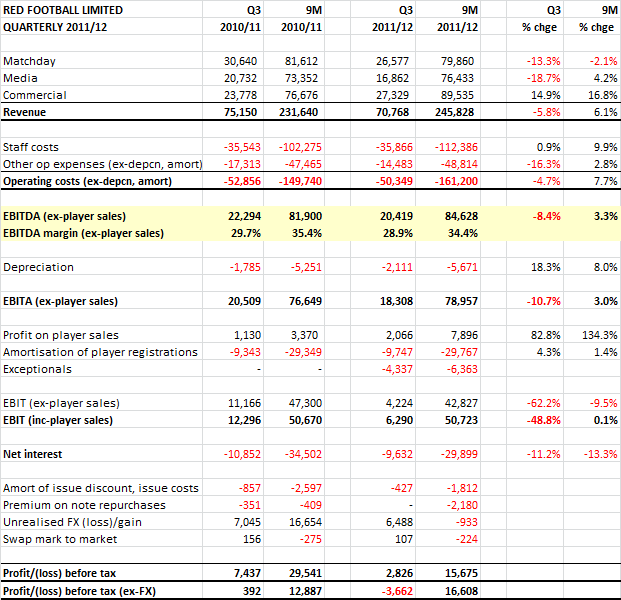 The poor performances in Europe and the domestic cups can be seen in these quarterly figures. Matchday income fell 13% compared to last year as the club played seven home games compared to last season's nine. Of the seven played, two were in the Europa League in front of smaller gates paying lower prices. Media income fell 19% compared to 2010/11 despite the higher share of the UEFA CL "market pool" this year. The explanation is simply the exit from the Champions League. The impact will be far more severe in the current quarter of course when there will be no CL media income at all compared to the previous year's run to the final. Commercial income was again the star, with the new contracts signed since last year; DHL, Epson etc and a step up in Nike income and income recognition boosting revenue by 15% compared to 2010/11. In total, revenue fell 5.8% year-on-year in the quarter and revenue growth for the nine month period was 6.1% (down from 11.9% in the first half of the year). United may be a commercial powerhouse, but old fashioned football success and failure can still have a major impact. Staff costs only rose 1% compared to last year, reflecting lower bonuses (presumably linked to qualification for the CL knock-out stages). The wage bill for the year to date is still 10% higher than last season, although the fourth quarter will not see any of last season's bonuses. The major fall in operating expenses (down 16.3%) is largely due to the lack of domestic home cup games. The club accounts for the gate sharing for such games as an expense and this season there were no such games. With revenue down 5.8% and costs only down 4.7%, EBITDA fell 8.4% and for the first nine months of the year was only up 3.3%. There will be a larger fall in Q4. These falls shouldn't be overplayed, with United still making cash profits before transfers of £85m in the first nine months of the season. That is more than any other English club has made over any twelve month period. The worry for the Glazers, is that the profits are stagnating this year at a time when investment is needed to keep up with City and others, and none of that is good if you hope to float your club on a stock exchange. The club made a small £2m profit on player sales during the quarter (Gibson and Ravel Morrison). The amortisation charge (how transfers are "charged" in accounts) was basically unchanged at £9.7m for the three months. To put this in context, the c. £40m annual amortisation charge compares to a figure of £83.8m at free spending City in the last reported season (2010/11). There was a £4.3m "exceptional" charge during the quarter which the club says related to "professional advisory fees" and the need to top up the Football League pension fund. I suspect the "fees" element accounts for the great majority of this £4.3m and relates to advice on the mooted IPO. The interest charge is spread evenly over each quarter even though bond interest is paid twice a year in February and August. The club recorded a "gain" of £6.5m as the pound rose against the US dollar, reducing the sterling value of the club's dollar denominated bonds. Taking all these charges and credits into account, pre-tax profit for the quarter was £2.8m, down from £7.4m last year. As I always say in these pieces, I do not consider the profit and loss account described above to be particularly informative when looking at football clubs below the EBITDA figure. The cash flow statement is often more informative. Cash flow includes real spending on transfers which are after all cash transactions (the amortisation charge is a significant simplification by contrast). For United, lumpy bond interest payments and bond buybacks are also a fact of life that constrain what the club can spend. Despite their advantages, cash figures come with a warning however. Football is a seasonal business with season ticket revenue collected in the summer, boosting cash balances. The end of the season also see large TV payments from the Premier League and UEFA. Furthermore, prepayments on sponsorship contracts can lead to large positive and negative swings in cash and at United there are large interest payments in the first and third quarters of each financial year. It should be remembered that United are the only football club to publish quarterly figures (a requirement of the bond issue), all other club accounts are struck at the seasonal high point for cash in the summer. 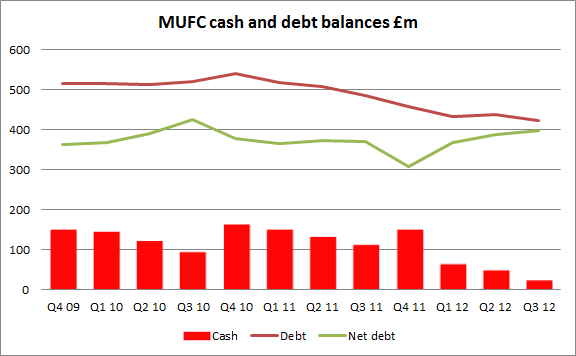 Manchester United is not like other football clubs of course, because it has £420m of outstanding bonds. Since the bonds were issued in February 2010, the club has periodically gone into the market and repurchased them (usually paying more than the issue price). These buybacks make financial sense (the bonds cost c. 8.5% whilst cash at the bank barely yields 1.5%) but risk depriving the club of cash needed for investment. It is a choice made by the Glazers and their management team. Since June 2011, the club has spent £71m on buybacks and interest payments which together with the other seasonal cash outflows described above has pushed the club's cash reserves down to a low of £25.6m at the 31st March. As described above, there will be the usual rebound in the club's cash position in the current quarter, although the precise amount is very hard to estimate. 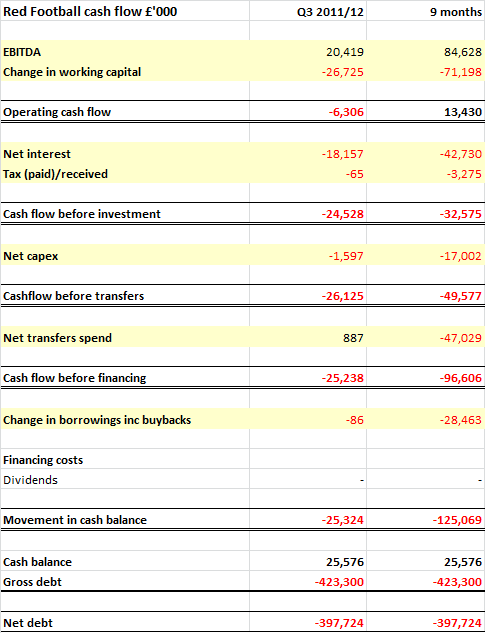 Judging from previous years and taking into account the lower profits caused by the CL exit, I estimate the cash position will improve to c. £75m by the end of June. The big question supporters want answering is not about buybacks or EBITDA, it's about spending to keep the club competitive after a season when the squad was found wanting at home, but especially in Europe. I can't give an answer to whether the club will spend, only the Glazers can, but the very issue raises big questions over their strategy for running the club. Since the takeover, Fergie's genius has allowed United to consistently win trophies (with a couple of rebuilding dips on the way) whilst keeping the club's wage spending to turnover ratio very low (45.7% so far in 2011/12 for example) and whilst spending very little on transfers (average net spend of £16m per season). This combination of controlled wages and low transfer spending is vital for two reasons. Firstly it theoretically boosts the value of the club (if you look at valuation based on EBITDA). Secondly, it frees up profits to service the enormous debts taken on to buy the club. Since the takeover, 18% of revenue has gone on interest. This has been "affordable" because the club hasn't ever really had to "pay up" in either wages or transfers. Since 2005 the challenge of achieving this financial balancing act has been aided by a number of factors. In the years immediately after the takeover, the 40%+ ticket price rises were crucial. The Ronaldo windfall in 2009 and, to be fair, the rapid growth in Commercial income in the last two years have also been significant pluses. Now however, the trick is becoming more difficult to pull off. Bond buybacks and interest have eroded the club's previously huge cash balance. There has been spending (£47m last summer) but not on crucial areas of the pitch (United haven't bought a central midfielder since Ronaldo departed). Major transfers cost money twice over, both driving up wages and demanding immediate cash. Wage inflation and transfer inflation across football remain endemic and the advent of FFP appears not to be having any impact on this. If United are to strengthen, money will be needed and that means no more bond buybacks. It probably means lower profitability, in at least the short-term, with negative implications for the valuation achievable at any IPO. The alternative may well be under investment and the club going further backwards relative to its main competitors. The Glazers know their structure hampers the club. There was heavy briefing of journalists in the run up to the aborted IPO process last year, suggesting debt would be paid down from the IPO proceeds to make United more "competitive". If the IPO can't be delivered however, the club is stuck with its debt and the owners will have to accept lower profits or further relative decline. Can they square this circle? Normal health warning: if you don't think a United supporter can impartially analyse Liverpool Football Club's finances don't read on. Liverpool are a club in transition on and off the pitch. The financial results published overnight show just how great is the challenge facing Fenway Sports Group ("FSG"). We can now see that the American owners spent £261m acquiring and refinancing Liverpool. Of this figure only £30m has actually flowed into the club, the rest was spent on the purchase itself. The primary operating company of Liverpool Football Club is "The Liverpool Football Club and Athletic Grounds Limited" which the the main entity I will focus on. Since 15th October 2010, 100% of this operating company has been owned by a new vehicle "UKSV Holdings Company Limited". UKSV is in turn owned by NESV I LLC, a US company also (and commonly) known as "Fenway Sports Group". The accounts of UKSV only run from 1st October when it was established to 31st July 2011. The accounts of the operating business, which I'll refer to as "Liverpool" or "the club" for ease, run for the year to 31st July 2011 (i.e. last season). Before the club's accounts were available at Companies House, Managing Director Ian Ayre gave a lengthy interview to the club's website and to the Liverpool Echo. Without making the accounts available, Ayre threw around various numbers and in particular blamed the £50m pre-tax loss on a write-off of work on the abandoned stadium plans. Whilst the write-off had a big impact, he was being pretty disingenuous by not mentioning a pretty exceptional profit (£43.3m) on the sales of Fernando Torres and Javier Mascherano. 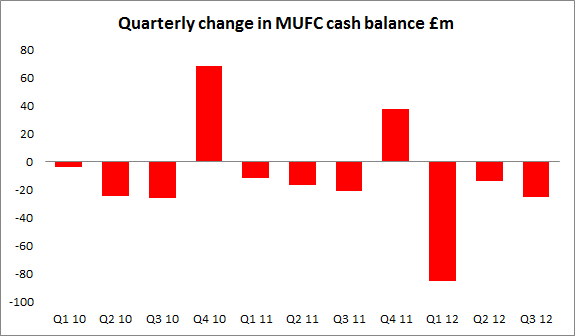 This profit largely offset the stadium write-off (£49.2m) and that meant that the underlying results were very poor. Ayre is not alone in spinning his club's financial figures before they come out (hello Chelsea) or not being straight with his supporters (hello United and many, many others), but it is still pretty poor. The club is in transition and there is surely no need for such spin. Football clubs are simple businesses. There are three revenue streams (matchday receipts, media income and commercial deals) and two main operating costs (wages and the costs of operating the club day to day). The difference between these numbers is "EBITDA" (earnings before interest, tax, depreciation and amortisation), effectively cash profits before any investment or the servicing of debts. After EBITDA come depreciation of the stadium, training ground etc, "amortisation" which is how transfers are accounted for, then interest and (rarely in football) corporation tax. 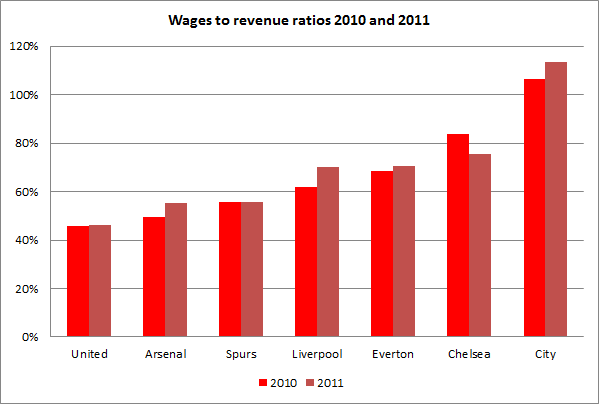 Liverpool's results for 2010/11 show what happens when costs run ahead of revenues; profits collapse. This is of course the curse of football finance. Success brings income so clubs invest in player wages in the pursuit of this success. Fail to do well on the pitch and the costs are still there but not the income. Liverpool's revenue was effectively flat last season (down 0.5%). Matchday income fell 4.6% despite the same number of home games, reflecting a small fall in average attendances (40,224 vs. 41,940) more than offsetting ticket prices rises and must imply a fall of in corporate hospitality too. Media income was down 18% as the club failed to qualify for the Champions League (losing £25m of income). This was partly offset by £5m of Europa League income and the £7m increase in PL TV money from overseas rights. Commercial revenue was the star area with the Standard Chartered deal driving it up £15m or 25%. The Warrior kit deal will not impact the accounts until 2012/13. Although revenues were down a fraction, there was significant cost growth as the club spent heavily in an attempt to break back into the top 4. Pre-exceptional staff costs rose a very punchy 12.7% year-on-year. This wage growth is more down to contract increases than transfers in my opinion. Although the club signed Cole, Poulsen, Konchesky, Meireles etc, Mascherano, Riera and Benayoun all departed and the January flurry of transfers will not have impacted the full year numbers significantly. 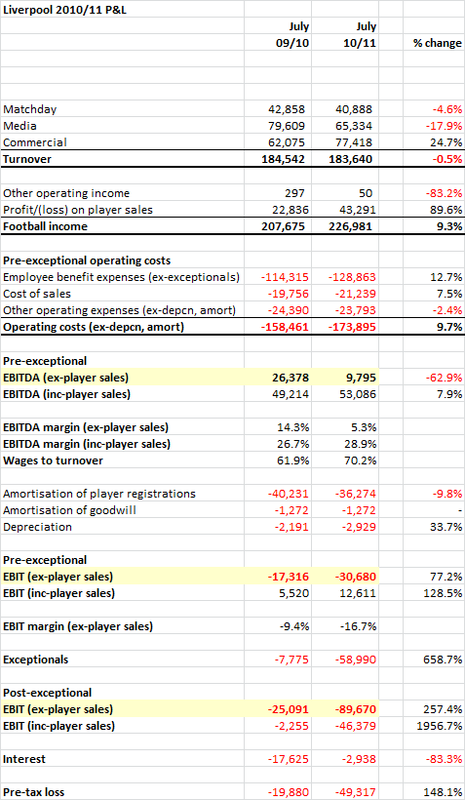 Total operating costs (pre-exceptionals) rose 9.3%, driving EBITDA before players sales down by 63% to only £9.8m, a margin of 5.3%. The graph below shows how the club's EBITDA has fallen very sharply since 2009 revenue despite growing slightly. Liverpool are overspending. The issue of rampant wage inflation is not of course unique to Liverpool. 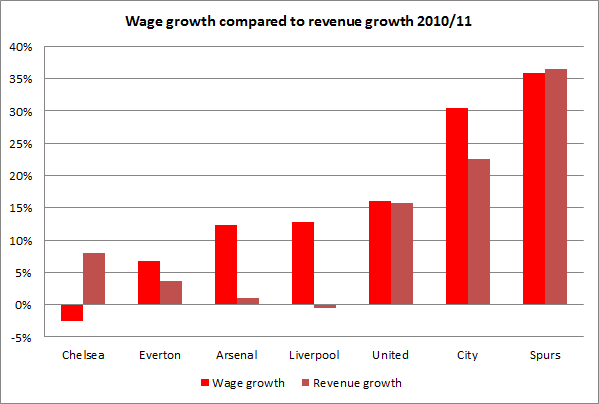 The graph below shows that Arsenal, Everton, United and City all saw wages rise faster than turnover last season. The problem for Liverpool is however more acute than at other clubs, fundamentally because Liverpool are operating a squad with a Champions League cost base without Champions League income. Liverpool's wage bill is quite competitive in Premier League terms, fourth behind City, Chelsea and United but the dreaded wages/turnover ratio is rising sharply (up to 70% from 62%). That puts Liverpool much closer to Chelsea (76%) than Arsenal or Everton (55% and 56% respectively). Amortisation is the method by which transfer spending is recognised in the profit and loss account. It reflects the level of transfer spending a club does, spread out over the life of player contracts. Importantly it forms part of the UEFA's FFP calculation. At Liverpool the amortisation charge has been quite high, reflecting steady transfer spending under Benitez and Hodgson. The charge fell from £40m to £36m in 2010/11. Depreciation (on Anfield and Melwood) was up slightly at £2.9m (vs. £2.1m). Exceptional costs totaled £58.99m in 2010/11. Of this, £49.2m was a write-off of capitalised costs relating to the abandoned stadium project. It is important to stress that this is not a cash cost in 2010/11, the money had already been spent in previous years. Most of the balance of the exceptional charges relate to getting rid of Roy Hodgson. The club spent £8.4m changing managers last season compared to £7.8m getting rid of Benitez the year before. The interest charge fell very sharply from £17.6m to £2.9m as the burden of Hicks and Gillett's debts was lifted. It is worth noting that cash interest paid actually rose slightly. Although not treated as an "exceptional", the club recorded a huge profit on player sales in 2010/11. Such profits are calculated as the difference between the price at which a player is sold and his "book value". Torres was acquired for around £20m and probably had a book value of around £10m when he was sold to Chelsea. That means the club recorded a profit on his sale of around £40m. Add in Mascherano and the "profit on player sales" was £43.3m. Bringing all these numbers together, Liverpool reported a pre-tax loss of £49.3m compared to £20m the previous year. The exceptional charges are unlikely to re-occur, but neither is the enormous profit on Torres. Estimating a "normal" profit on player sales is very difficult (the figure was £23m in 2010, £4m in 2009), but £10m looks a reasonable estimate for a club with Liverpool's strong youth set-up. Stripping out the exceptional costs and using £10m for a "normal" profit on player sales implies an "underlying" pre-tax loss of c. £23m. 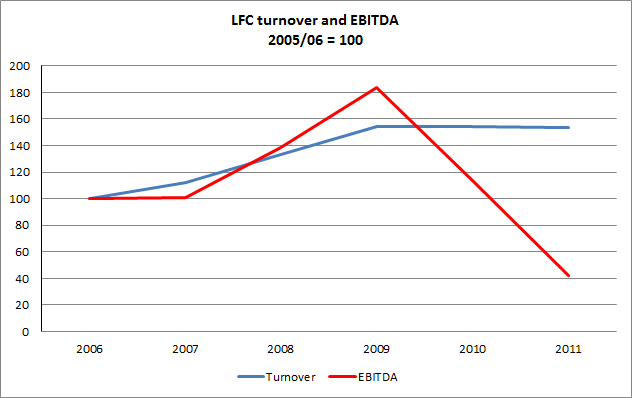 The collapse in EBITDA means Liverpool are structurally loss making at these level of income and wages. To change that of course, the club need cheaper players or more revenue. The collapse in EBITDA (here including cash exceptionals), led to a very sharp fall in operating cash flow at Liverpool. Unlike in the P&L, the transfer spending here reflects actual cash spent and received and with the Carroll spending paid up front but the Torres receipts staggered, there was punchy £40m of cash spending in 2010/11. Deduct interest and the club saw a £42.5m outflow before financing. It goes without saying that Liverpool need to generate more EBITDA and hence cash flow to be able to compete in the transfer market in the future or will need subsidising by FSG. 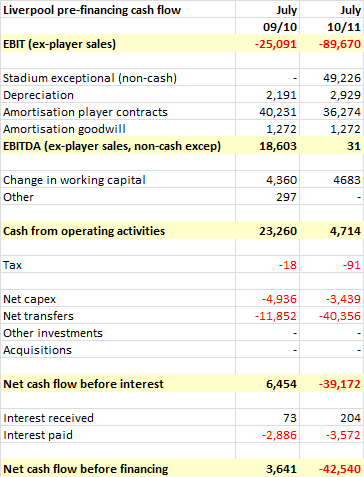 Of the £42.5m cash outflow shown above, £26m came from an injection from new parent company UKSV and the balance from running down the club's cash balance (which fell from £19m to £2.5m). The £30m "debt" on the Liverpool balance sheet owed to UKSV/FSG is really equity by another name (it attracts no interest). At 31st July there was a real bank loan of £37.7m (the "stadium finance" part of a larger £92m facility with RBS and Wachovia/Wells Fargo) secured on the club's assets. On 30th September 2011, the club entered into a new £120m facility with RBS, Bank of America and Barclays for £120m. The facility runs for three years. £45m is the stadium project facility and £75m for "general corporate purposes". Whilst with year end debt of only £37.7m there might appear to be plenty of spare capacity, football clubs' cash positions are highly seasonal and the club will definitely need this facility during the course of the season. We do not know the interest rate on this debt (the old facility was LIBOR +450bps). Fenway have a very big challenge keeping Liverpool competitive in the next few years. The Warrior kit deal next season will add c. £13m (7%) to revenue, but there was no Champions League football in the current season and there won't be any next season. 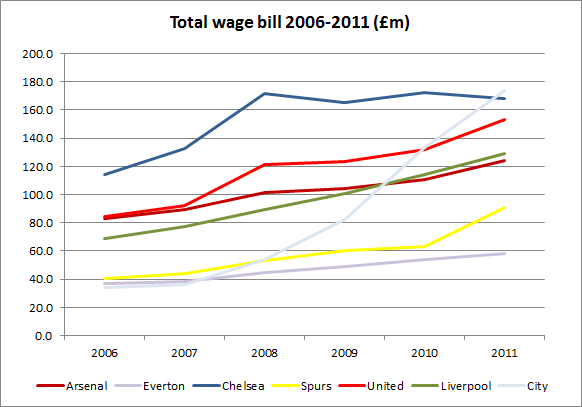 Wage inflation across football remains endemic despite the imminent arrival of FFP. The playing squad needs investment and a new ground is desperately needed. If all that wasn't bad enough, the competition for CL places is far fiercer than it was in the good old days of "the big 4". A £100m+ wage bill used to guarantee qualification for the CL, now it barely guarantees qualification for the Europa. The great unknown in all this is the willingness of FSG to invest their own money in Liverpool FC. So far £30m has flowed in on top of the cost of acquiring the club. The expansion of the banking facility very much suggests that the business will be debt not equity financed in the next year or two and that is a worry. Despite all this gloom, I think Liverpool will negotiate these financial risks, for two reasons. Firstly as shown by the Standard Chartered and Warrior deals, the club is a big brand still on the global stage. It is commercial success that has allowed United to compete despite its debt burden and remains a key advantage for Liverpool too. Secondly, there is significant scope to expand matchday income if a new stadium can be developed. Liverpool L4 is not London N5, but Arsenal's move to the Emirates gives a flavour of what can be done. Liverpool's matchday income is only 37% of United's. FSG need to close some of that gap. The other thing Liverpool need is for Financial Fair Play to be rigorously enforced. This is the great unknown of course, but FSG have clearly made a bet that it will stick. Taken together, the Liverpool "project" is a steep, steep challenge.